At one time, Underwood and Underwood was the largest publisher of stereoviews in the world, producing 10 million views a year. Underwood & Underwood established itself in 1882 as a stereographic distributing company. The company was founded by two brothers, Elmer and Bert Underwood. The brothers developed a selling system of thorough canvassing using college students. 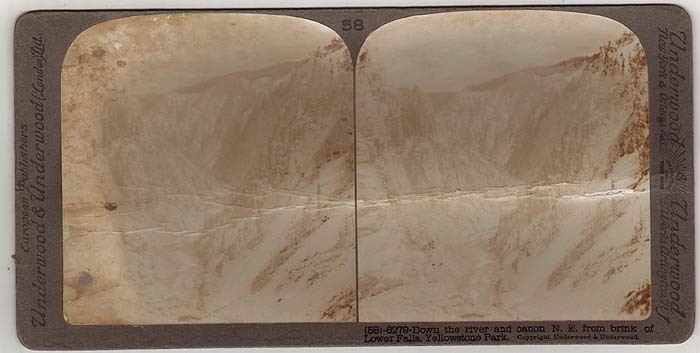 They distributed stereographs for Charles Bierstadt, J.F. Jarvis and the Littleton View Company. By 1887, they outgrew their original office in Ottawa, Kansas, and moved to New York City; offices were also opened in Canada and Europe. In 1891 Bert learned how to operate a camera and thus the firm of Underwood & Underwood Publishing entered a new merchandising sphere. By 1897 the company had a number of full-time staff and free lance photographers. In the same year the Underwoods purchased the businesses of Jarvis; Bierstadt; and, William H. Rau. 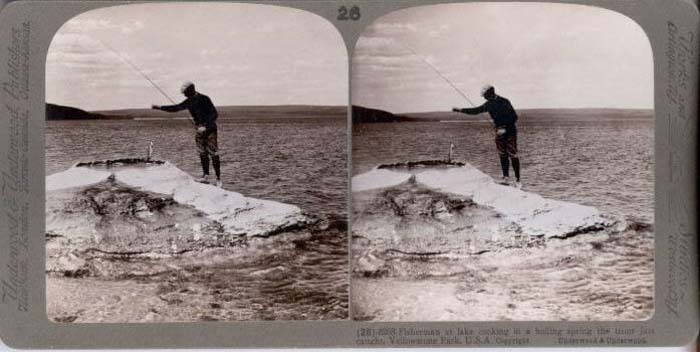 Underwood & Underwood were publishing twenty-five thousand stereographs a day by 1901. 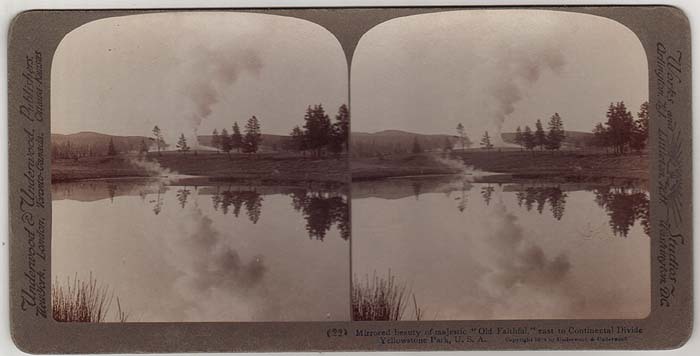 The firm still canvassed and sold its own stereographs. Around 1900 Underwood & Underwood introduced boxed sets, with specific themes such as education and religion, and travel sets depicting popular tourist areas of the world. By 1910 Underwood & Underwood had entered the field of news photography. 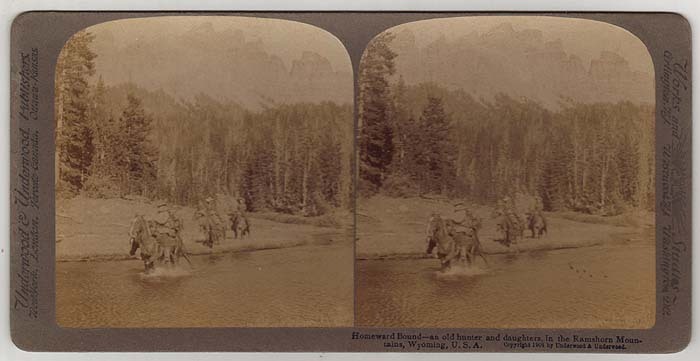 Due to this expansion stereograph production was reduced until the early years of World War I. Altogether Underwood & Underwood produced between 30 000 and 40 000 stereographic titles. In 1920 stereograph production was discontinued and Underwood & Underwood sold its stereographic stock and rights to the Keystone View Company. The negatives passed to Keystone which issued them with a "V" prefix. The Glass Mountain, A Huge Cliff Formed Of Volcanic Glass. Copyright 1902 by Underwood & Underwood. An unnumbered beige mount. This view shows a wagon on the road near Obsidian Cliff between Norris and Mammoth. It has a blank verso. Looking down Golden Gate Canon, Yellowstone Park, U.S.A. This unnumbered beige mount has the title in 6 languages on its verso. 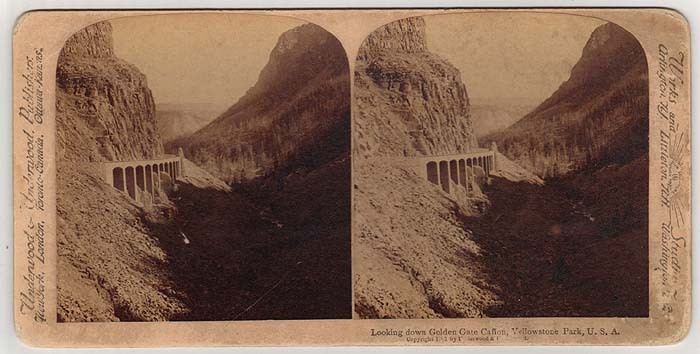 The image is a traditional view of Golden Gate Canyon. Yellowstone Park, U.S.A. Copyright Underwood & Underwood. A typical Underwood gray mount view. Notice the boxed set number 26 in the upper center as well as in parenthesis at the lower center of the view. 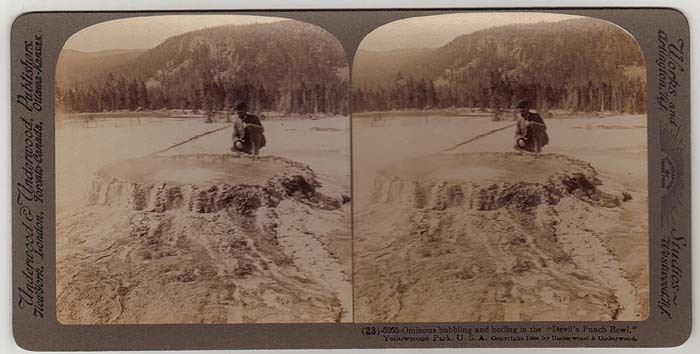 This photo shows a fisherman boiling his catch at Fishing Cone in the West Thumb Geyser Basin. 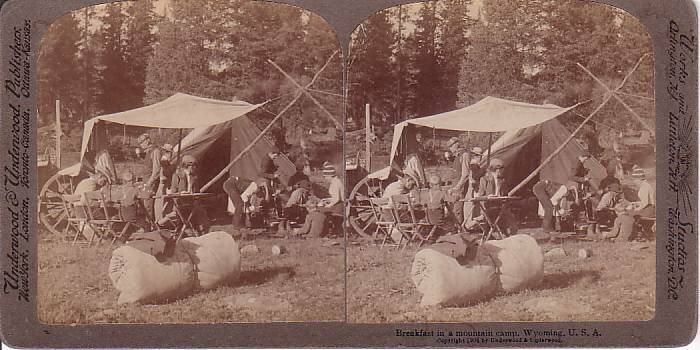 Breakfast in a mountain camp, Wyoming, U.S.A. Copyright 1904 by Underwood & Underwood. 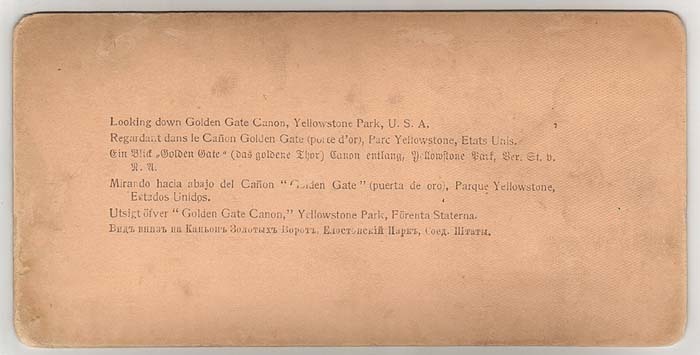 This unnumbered gray mount shows a picturesque mountain camp near Yellowstone. Underwood produced many views just outside the park. Yellowstone Park, U.S.A. Copyright 1904 by Underwood & Underwood. Another boxed set gray mount, this view has only its boxed set number 22 in the lower center. Notice how there is an absence of any 4 digit catalog number that so often appeared on Underwood views. The verso of this view is blank. (23) 6265 Ominous bubbling and boiling in the "Devil's Punch Bowl,"
A common Underwood view type is this style of gray mount It has both the 4 digit catalog number and the boxed set number in parenthesis. 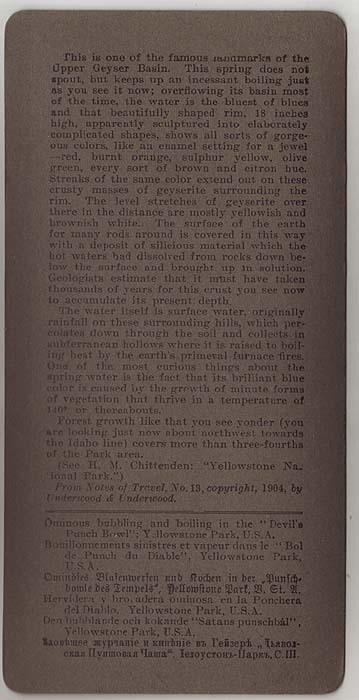 It also has an extensive description of the view on the reverse side. These views can be readily found today. Gallatin Range (left) and Buffalo Plateau. Copyright 1904 by Underwood & Underwood. 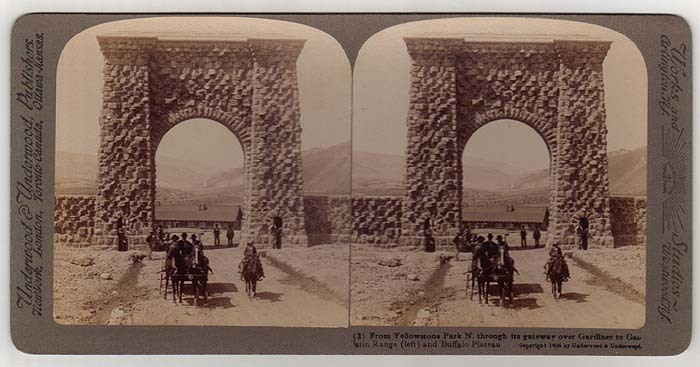 This boxed set view of the Roosevelt Arch is much like the view (22) shown several photos above. However this one has an elaborate reverse description. Yellowstone Park. Copyright Underwood & Underwood. 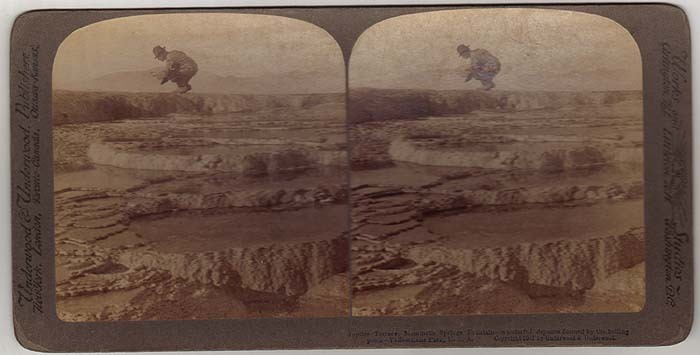 This faded view of the Grand Canyon is a rare European issue by the company. On the left side it credits, "European Publishers, Underwood & Underwood." This view was likely printed from their London office. Yellowstone Park, U.S.A. Copyright 1902 by Underwood & Underwood. Another common view is this unnumbered gray mount. It shows a gentleman examining the terrace formations at Mammoth. The verso of this view is blank. Wyoming, U.S.A. Copyright 1904 by Underwood & Underwood. Another unnumbered gray mount image taken just outside the park’s northern boundary near Ramshorn Peak. 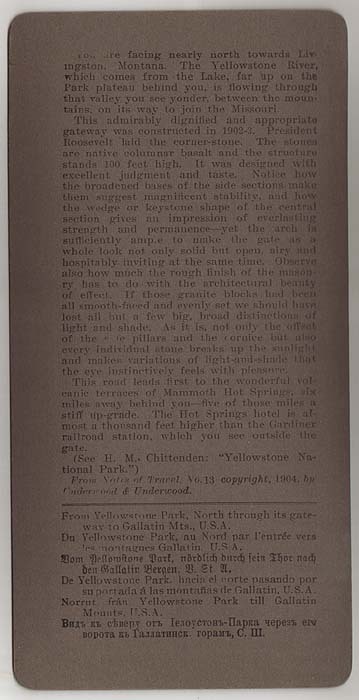 Underwood captured many views from Teddy Roosevelt’s historic visit to Yellowstone. Above is such an example. These presidential views are highly sought after by collectors today.